Oh, hello there Monday! I hope y'all had a great weekend; as usual mine was pretty low-key. I shared a quick project on my IG story about some furniture that I restored. And since y'all seemed interested; I'm thinking I'll share more of my DIY projects and home tour as I get the rooms all done. Another top that most of you are interested in is in regards to my husband. So if you have any questions, I'm going to be composing and answering in a blog post. No question is off limits and you can submit them on this blog post, through my contact form here, by email [thegoldengirldiary@outlook.com], or through any other social media messaging platform. Can't wait to see what y'all are interested in learning about! But can we just talk about this top?! Y'all it's striped AND peplum. That is what I call a win. And even better? It's only $28. If you're located in South Carolina or some where with similar climate, then you probably know that tops like this will be your best friend through all of our fall. I say that because our falls are typically very mild. More like summer temperatures! Or at least that's what I'm told since this is our first fall in South Carolina. 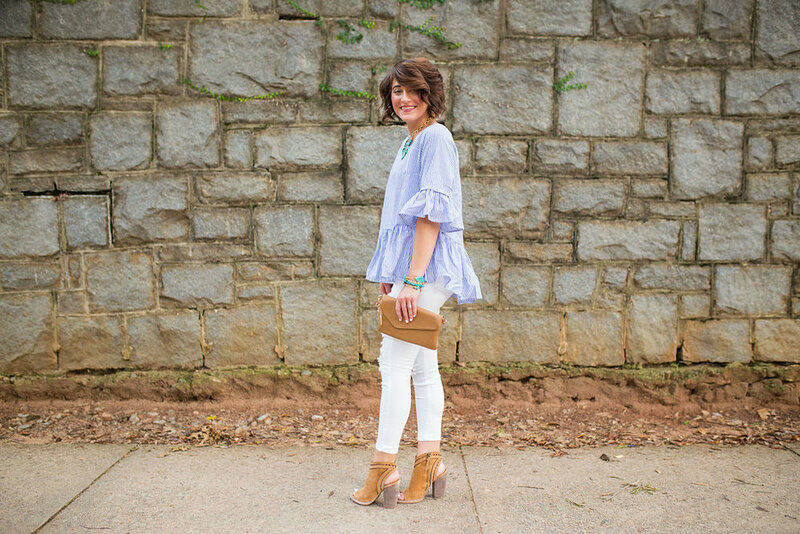 And if you're strict about no white jeans after Labor Day, then you can throw this top on too with your favorite pair of dark denim. And since it's a neutral color you could pretty much add any pop of color to this look as well! Enjoy the Total Eclipse if you'll be watching; if not enjoy your Monday!